No. 1 seed Gonzaga made a frenzied effort to dig out of its 7-point deficit with 52 seconds remaining in Saturday night's Elite Eight game, but fell just short in a 75-69 loss to No. 3 seed Texas Tech. The Zags cut the lead to within two on two separate occasions over the final minute, including with 12 seconds remaining. But a lapse in judgement from Bulldogs guard Josh Perkins in reaching over the plane on an attempted Texas Tech inbounds play awarded the Red Raiders two free throws -- which they made -- and essentially iced the game. CBS rules analyst Gene Steratore spoke about the mishap after the game and explained the thought process behind the call. Steratore, a longtime official, says he agrees with the call that was made on the floor. "What they ruled was the player who was inbounding the ball had possession of the ball," Steratore said. "By rule, if he has possession of the ball and it does not break the plane, thus putting the ball on the inside of the court, and it is contacted, that is a technical foul. The fact that they ruled it as a technical foul does allow Texas Tech to choose whomever they want to shoot those two free throws. Texas Tech chose Davide Moretti to do the honors, and he awarded Chris Beard's confidence by making both free throws on the other end to make it 73-69 with 12 seconds remaining. It would not get closer from there. The Zags have a right to be upset about the official ruling on the play. According to Steratore, a common foul could also have been called, and in this case, the common foul would have been elevated to a Flagrant 1 foul. If the officials had chosen to call that instead of the technical, Texas Tech would have had to send Matt Mooney -- who was 4 for 4 from the free throw line but shoots 76.5 percent from the charity stripe as opposed to Moretti, a 92.1 percent free throw shooter -- to the line to potentially ice the game. The controversial technical foul was not the only one that is being examined closely in the aftermath of the game. Another questionable call came with just under one minute to play when Gonzaga, trailing by six, had a 3-point attempt blocked by Texas Tech's Tariq Owens. Owens masterfully closed, hands colliding with the ball, and leapt out of bounds to save it. In the process, Owens appears to have had his right foot out of bounds before making the play. The play was consequential. After the block and steal where Texas Tech regained possession, Gonzaga was left trailing by two possessions and forced to foul. Texas Tech hit one of its two free throws to extend the lead. But wait -- there's more! And this one went in favor of Gonzaga. With Texas Tech up five with under 30 seconds to go, Moretti turned the ball over, and moments later, Josh Perkins nailed a 3-pointer to cut the lead to two. During the sequence, it was evident that a kick ball could have been called, which would have blown the play dead before Gonzaga made the shot. Rules prohibit players from intentionally kicking the ball, but it is up to the referee's discretion to determine that. Whether you're a Zags or Red Raiders fan, there is plenty of complaining to be had here. Bang-bang plays in real-time can be difficult to officiate. 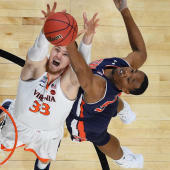 In this case, it seems the calls evened out in the end, but it's unlikely fans of either team will be pleased after reviewing what happened in a wacky and wild finishing minute of the first Elite Eight game of the weekend.